"I'm One Month Old Today!" I can't believe it. This little boy is one month old today! Lincoln is doing SO well. He is sleeping great, nursing like a champ, and has just fit so perfectly into our family. AND, he is finally able to wear more than just preemie clothes! YEAH! Happy 1 month birthday to Lincoln. He is so cute! I cant believe he is one month old today either!! Does he look just like you? From where I sit it seems that he does. OK, only a few people in this world would have coordinating shoes for their one month old's outfit...I'm glad I'm in good company! LOL! Still on pins and needles for tomorrow. I'm also impressed with the coordinating shoes. Wow, where does the time go. He's so cute & look at you coordinating his outfit so well! I hope you're doing well...I've missed hearing from you, but believe you me, I know what your life is like right now! Sounds like you're doing great! Awwwww... he looks like he has your eyes, Sarah. That is so cute. yes he is! (cute as a button) happy one month, lincoln. glad to hear all is going well. keep up the good work, mom. Happy 1 month! He is still smaller at one month than mine are at birth! How is that? Congrats on Lincoln and enjoy! Glad he is adjusting smoothly with everything---what grace. He's a handsome one! Glad he is doing so well. I can't believe it's been a month either. Wasn't it just yesterday, you announced the arrival of little Lincoln? Very cute. Oh my goodness, what an adorable little man!! Happy 1 month bday big guy!! man, that month went fast. so cute! He will be running around with your other 2 in no time. SOO cute! 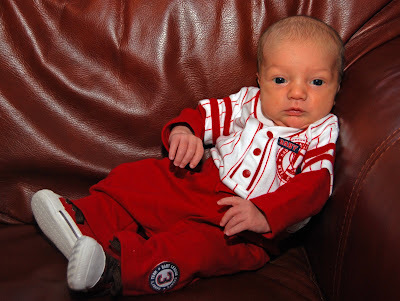 Love his little outfit and shoes - the little man has to be coordinated! The time goes by so quickly, can he really be a month old already!! Ry had fun listening to all the stories from the long weekend...especially "no-nuts!!" lol...love you all! Where has the time gone? He's as cute as ever! So glad he is growing up a storm. WOW, already a month old, and just as cute as a button!!! So happy to hear that he's sleeping well. What do the boys think of him, now that he's been home a while? What a cute little peanut! I can't believe how time flies. Love you, Sarah and Jay!